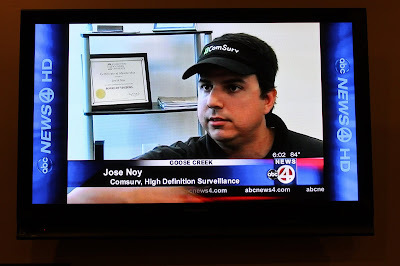 I was honored when approached by a reporter from ABC News Channel 4 who was researching small business robbery and surveillance systems. We set up an appointment to meet with Stefanie Bainum, reporter for ABC News 4, on Sunday the 12th. Stefanie conducted an on camera interview with Jose Noy, as well as collected images of our camera systems for the newscast. The story came about because of a recent string of robberies on small businesses in the Lowcountry. Stefanie looked to us to answer some of her questions on what small business owners can do to protect themselves against potential threats, and why they are being targeted. We offered up plenty of advice for business owners to consider when purchasing a security system. Some crucial points that were discussed include lighting, warning stickers and camera placement. We are very pleased at how the story came together, and are also very grateful to the ABC News 4 team for reaching out to us for help with this story.